Original text by Christina Rossetti (1830-1894) from A Pageant and Other Poems (London: Macmillan, 1881). PR 5237 P3 1881 ROBA. Text from Christina Rossetti, Poems (1890). Oh why is earth set so remote? I really don’t remember writing this piece. That’s an odd thing to say, especially in such a permanent format as this one, but the truth is that this music rang through my head as I was reading the poem for the first time, and I simply felt moved to write it down. Christina Rossetti’s words often do that for me, in a way that not many other poets’ words have the ability to do. There’s something so aching and haunting in her text; the challenge, as I’ve said before, is to fill up the space between the words without actually getting in the way of their meaning. 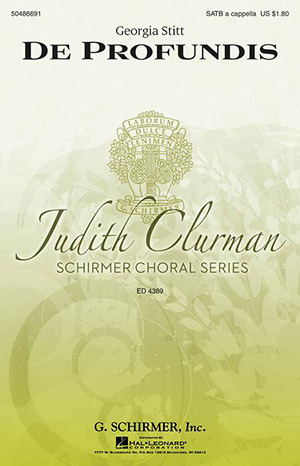 The wonderful Judith Clurman asked me to clarify some of the dynamics in this piece, and in tracking them I found myself resisting the urge to identify just how loud each crescendo should be. I know that my definition of mezzo piano might be different from yours, and so the secret (which is no secret) is that the phrases should just be musical. They should swell and retract, they should push and pull. Use the dynamic markings as a guide, but if your forte is filled with passion and your piano is filled with reverence, you’re probably singing it exactly as I intended. I’d like to extend my soulful thanks to Jeremy Faust and the International Orange Chorale in San Francisco. They premiered this piece for me back in 2004 and gave me my most beautiful first recording of it.